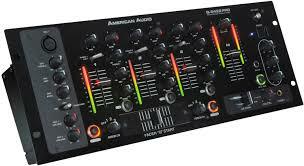 The American Audio Q-2422 PRO is a 3-channel rackmountable professional DJ mixer loaded with pro features from top to bottom. These include a high-quality Feather Fader for smooth, clean crossfades; Fader Q start; 3-band EQ on all 3 channels; 10 inputs; and balanced XLR outputs. Then it adds Stream Flow LED indicators on each channel, an easy access auxiliary input on front of the mixer to plug in MP3 players or satellite radio receivers, and independent pan & gain on each channel. It has 2 zone outputs and trim output adjustment on the rear. Improved mic circuitry, longer lasting line faders, and volume, treble, and bass controls for each of its 2 mic inputs are additional refinements.